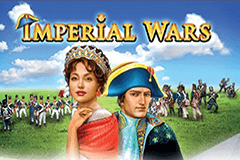 There’s not many pokies based around the Napoleonic wars, and the Imperial Wars video pokie from EGT could be unique. It’s a classically-styled 5-reel game, where 20 fixed paylines run across from the left side, and the images that fill them are equally classic, from the playing card symbols through to pictures of cannons, ships and soldiers. There’s some bonus treats in store for players who like the historical theme, such as wild substitutions and a free spins game where wins are guaranteed, and like most EGT online pokies, there’s the option to gamble wins several times over and the potential to win a progressive jackpot at any moment. Although EGT tend to specialise in dice and fruit symbols, when they launch a game based on a specific theme, they do it in style, and the Imperial Wars pokie certainly looks good. There’s the image of a desert behind the main game and some decorative design to the reels, but does it play well? The first thing that many players will want to do is review the pay table and find out what they can expect to win, as well as see how the bonuses work. Many pokies use the playing card symbols 10 through to A to make up the lower value combinations and this game is no exception, which is something that players will either like, because they know what each is worth in relation to others, or dislike because they want to see more theme-related images. The 10, J and Q will each return wins equal to 5, 20 or 100x the line bet when landing on 3, 4 or 5 reels, while the K and A symbols are worth 10, 25 or 150x. A line-up of soldiers in battle will see wins of 10, 50 and 200x paid out, and a sailing ship is valued at 10, 50 and 250x. The most valuable of the standard symbols are Napoleon’s wife Josephine, who returns wins of up to 500x and the Emperor himself, who awards payouts of 15, 150 or 1000x when he lands on 3, 4 or 5 reels of a payline. A triumphal arch pays out the top awards however, as this structure is worth 25, 200 and a massive 2000x, plus it doubles up as the wild symbol, able to act as all others, apart from the scatter and Extra Spin icons if it can complete a winning line. The cannon will fire off a free spins game whenever 2 or 3 land at once, anywhere on the first 3 reels. If just 2 cannons triggered the games, 3 free spins are awarded, while 3 of them will see 5 play out, but these can be valuable games, as the cannons will turn into extra wild symbols that expand across any reel they are on before the bonus games begin, and if the Sphinx turns up, there’s an extra spin added to the total. Having 2 or 3 reels fully wild will ensure that each spin is a winner, especially as they stay locked in place throughout the extra games, although it isn’t possible to retrigger the round, so once done, players return to the base game. If a win was for less than 700 coins, players will be offered the chance to gamble it, and can double the amount by correctly picking if a playing card will be from a red or black suit. Getting the choice wrong however, loses the gamble and although it’s a straight 50/50 pick, these can be quite risky in practice and as a consequence, it’s can be wise to only risk smaller prizes in these rounds. The other feature that players will hope to see triggered is the Jackpot Cards progressive game. Awarded at random, once it starts, they are guaranteed to win any of the 4 jackpots displayed above the reels that range in value from the small Club prize to the much larger Spade jackpot. First though, players will need to click on the playing cards that are laid out before them and the jackpot they win will be the one connected to the first suit found on 3 cards. An unusual, and possibly unique theme, accompanied by some fairly unusual bonuses, should be enough to see players marching to these reels. Apart from the interesting design, the real highlight of Imperial Wars video pokies is the way that the free spins bonuses work, as having multiple locked wild symbols, and the chance to trigger extra spins, is certain to earn some big real cash rewards. Having playing card symbols may be a downside for some players, and the game isn’t mobile-optimised, but this issues aside, it’s a quality pokie.